Mumbai-based Poncho Hospitality Pvt. 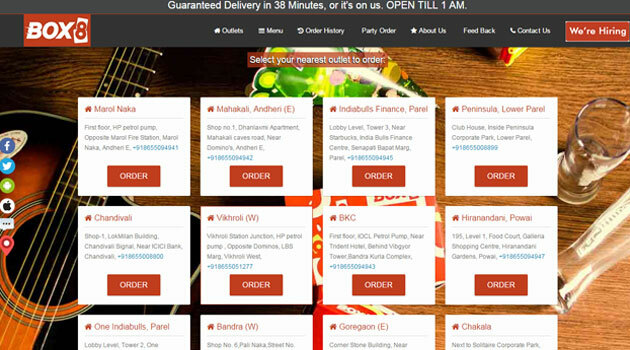 Ltd, which owns and operates a quick service restaurant (QSR) chain under the brand name of Box8 and positions itself as an on-demand food delivery services firm, has raised $3.5 million (RS 22 crore) in Series A round of funding from early-stage venture capital firm Mayfield. The on-demand food delivery startup Box8 will use the fund raised to build technology, expand team and deepen market penetration, it said on Thursday. "We have over 30 IITians in our team and we would like to hire more talented individuals from different backgrounds. Execution is the key to the success of this business and we want to build a team which focuses on getting the job done," Anshul Gupta, co-founder, Box8, said. The company would also use part of the investment to expand Box8's footprint in other Indian cities. Previously, Box8 had raised funds from Kaushal Aggarwal, co-founder and managing director of Avendus Capital, MuSigma's founder Dheeraj C Rajaram and Indian Angel Network. Founded in 2012 by IIT graduates Amit Raj and Anshul Gupta, Box8 is currently present in Mumbai and has 22 delivery units across the city. With over 2,000 transactions per day, Box8 claims to have grown 10x in the past 15 months. The startup also launched its app for Android and iOS, which allows users to order wraps and sandwiches. Ventures similar to Box8 include Faaso's and Hello Curry. Hello Curry recently acquired Paratha Post. Box8 Mayfield Fund LLC. Poncho Hospitality Pvt. Ltd.